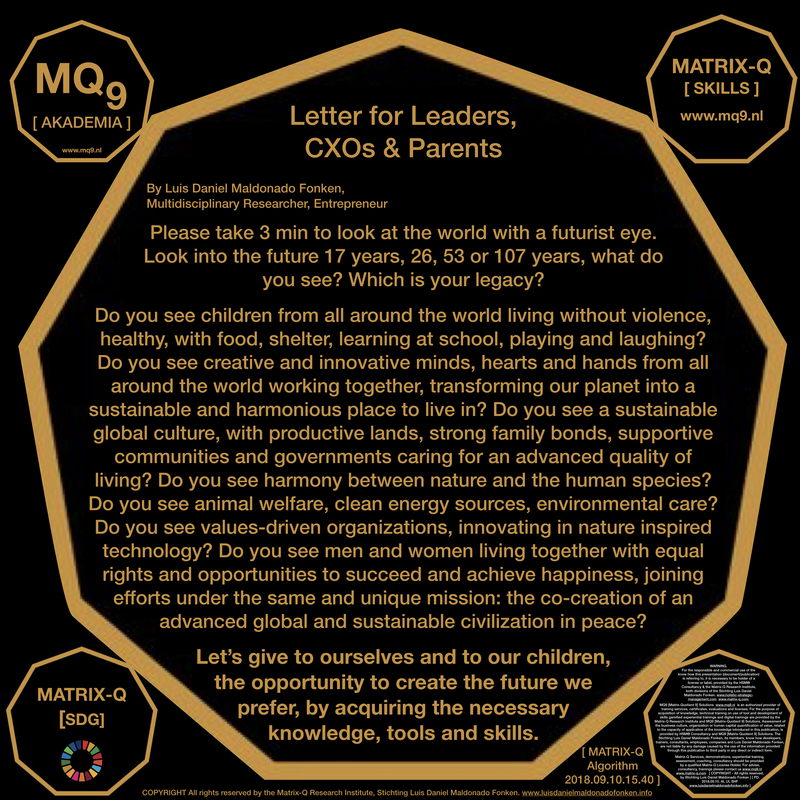 This document will intent to proof the contrary, that family keep being a vessel for humanity to evolve and that it actually holds within itself all the nurturing substances, experiences and challenges that can help humanity and culture evolve. Including both male and female human species, men and women. An brief introduction to some terms utilized will be included, as well as references to background knowledge and articles/presentations by the author which describe in more detail specific themes. 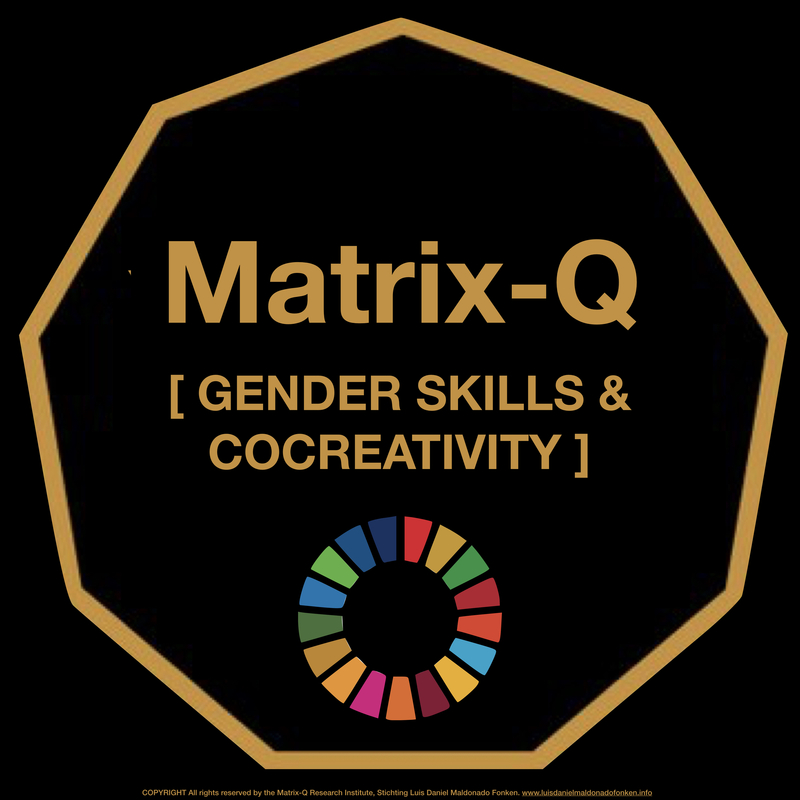 Matrix-Q Co-creativity approach for human effectiveness enhancement considers that specialized male and female skills have sustained the stability of family, parenting and relationship, also ensured resilience in a community which holds cultures, customs and perception of family as fundamental unit of the human social system. 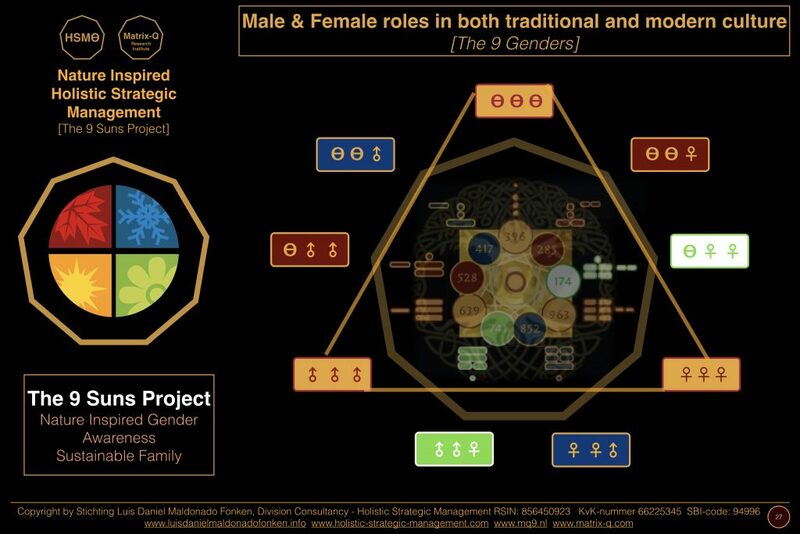 Male and female skills are correlated brain activity, hormonal shifts cycles, shifts and skills effectiveness variations, emotional intelligence, attention, focus, learning skills, communication, collaboration and leadership skills developed by thousands of years of human evolution and gender specialization, cultural perception, biological functionality and genetic condition. In both of them, those skills are in principle different, but it doesnt mean that one can not include or develop the other’s skills. 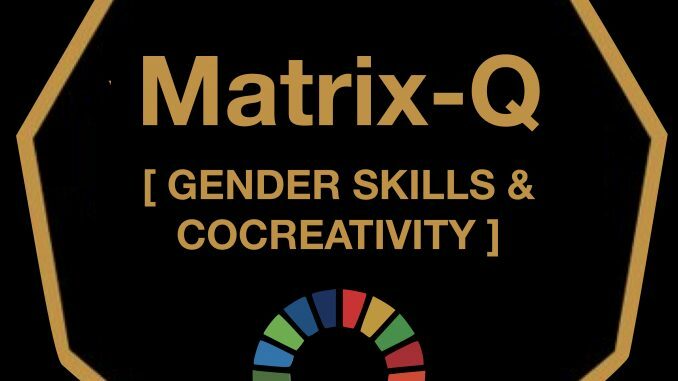 On the contrary and inclusive approach on gender skills suggests individuals to explore on sets of skills, perceptions and cycles that belong to the other gender. 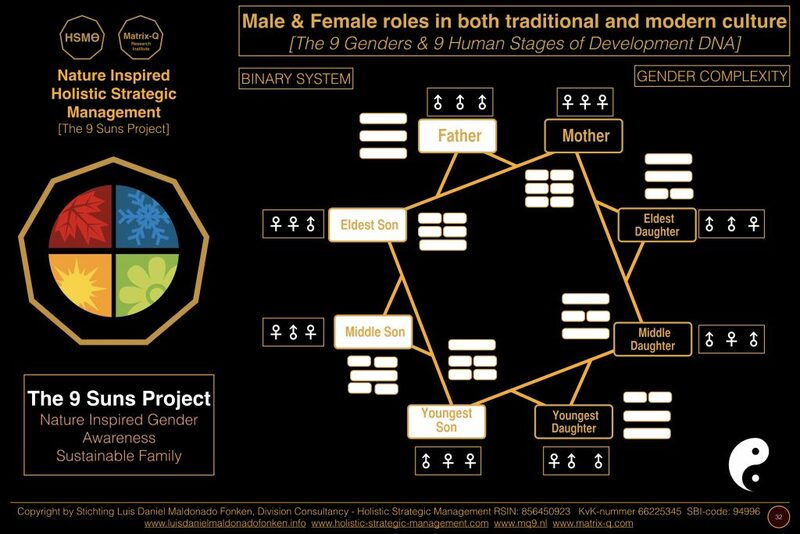 As for example, natural male ability to set goals and keep a consistent exponential learning curve and momentum for their achievement along a lineal time line would be enhanced by a natural female ability of perceiving and including community, process emotions and sustainability along the process necessary for the achievement of such goals. 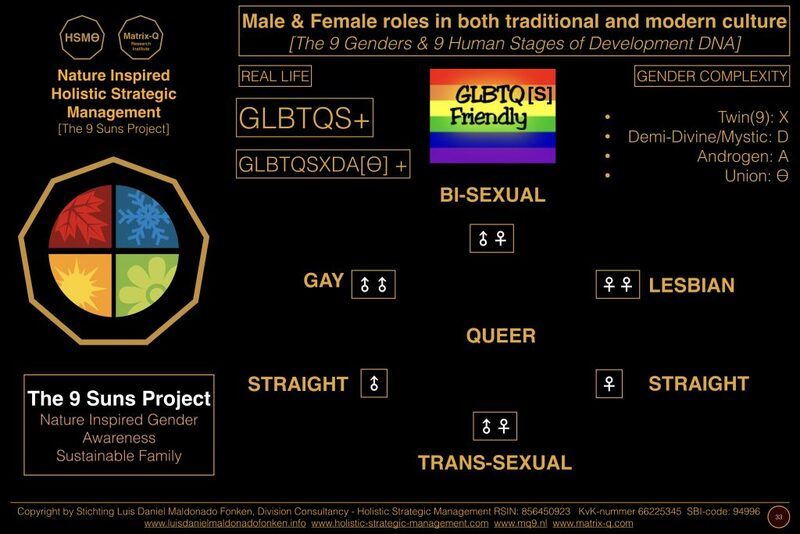 And this is only on single example of 100s of lessons on male-female inclusive skills that can bring a drastic change into human effectiveness. Leadership which includes both male and female skills as set of resources is more effective and friendly to family-life-work-balance, sustainable development, community and family. 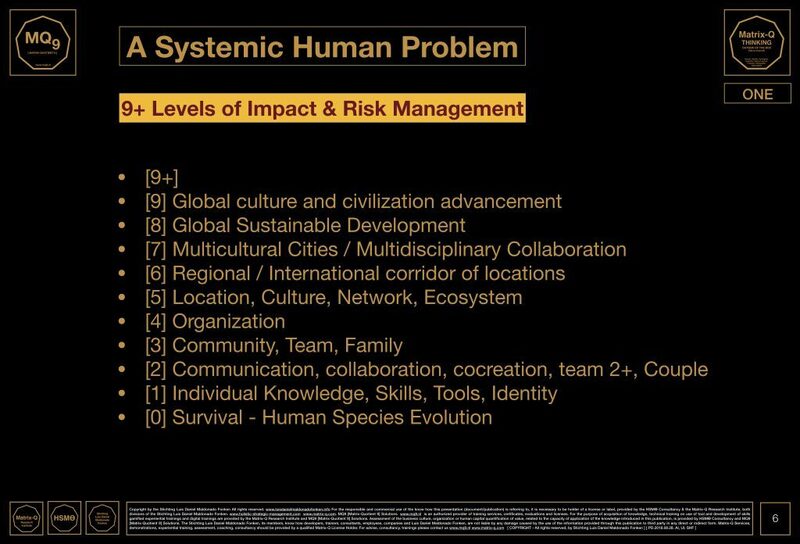 Sensitive and smart leaders, capable of communication and collaboration, to listen to their teams and community, and to assess the systemic impact of their decisions are necessary for a global sustainable culture and the emerging global civilization. Leadership skills are as important as parenting skills that include both male and female skills for the leadership, cocreation and sustainability of their own families and communities. Those skills leaders and parents need, are in essence both of them, the set of skills individuals need, within own self, the ability to include male and female skills in own personal development. 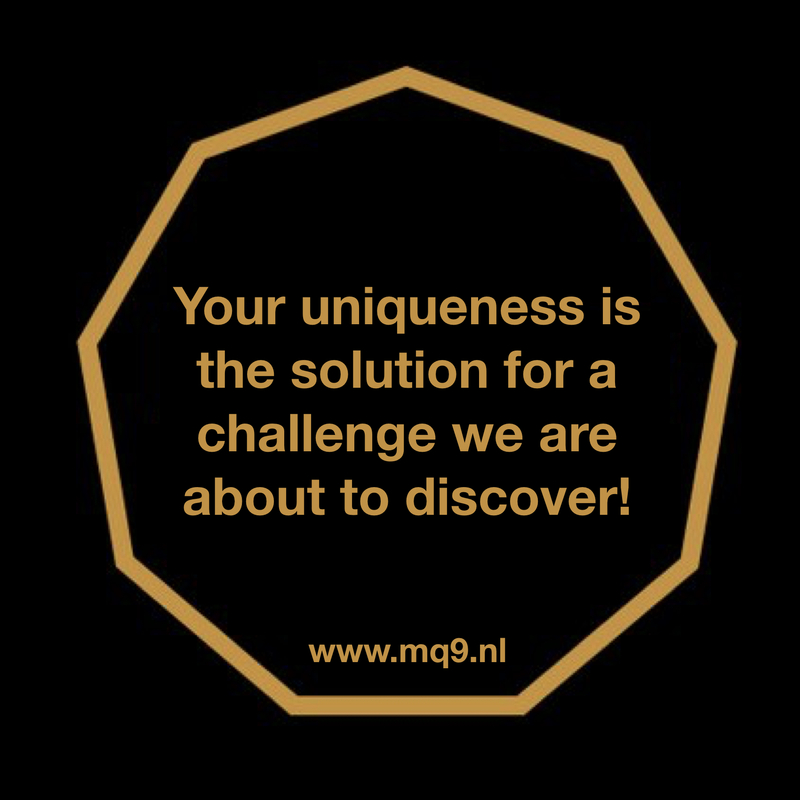 In order to include skills, its necessary the ability of learning and self-knowledge and the experience of diversity of skills, talents, individuals have available as potential within themselves and how each of them has a male and a female form of self-expression. For the process of learning the enhancement of Emotional Intelligence Skills is mandatory. 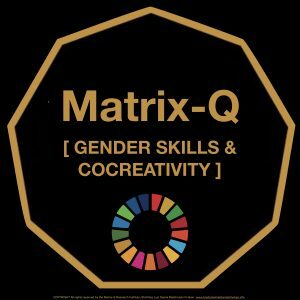 At the Matrix-Q Research Institute a new learning program has been build which focus on emotional intelligence skills and gives a strong attention to the ability of the individual and community of including gender specific skills, starting by becoming aware of them, and advancing their ability to apply them for specific purposes with effectiveness. [Matrix-Q Skills]. The Matrix-Q Research Institute study in the field of human potential, in particular human intelligence and human enhancement, gives attention to the changes experienced in individuals when parenting. After conception and birth of children, both male and female parents would advance their emotional intelligence, sensitivity, sensibility, social communication and collaboration ability, engagement, awareness, endurance, and most of all ability for decision making. 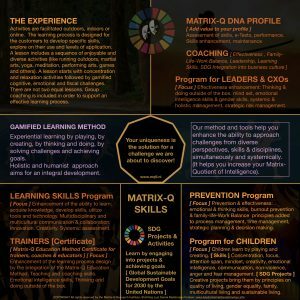 These changes combined with a foundation education in methodologies and tools, knowledge, in the field leadership, would help them advance their effectiveness. It is common knowledge that parenting triggers most profound instinct in the human species; which is extremely valuable for community building, resilience, and family sustainability, development of culture and civilization, and in general leadership. Strategic management, when approached from the sensibility of parenting, is naturally holistic and systemic. 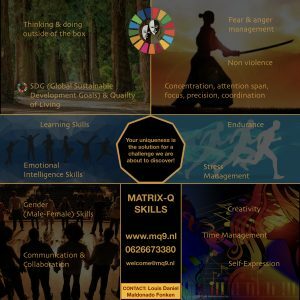 This is one of the reasons why effectiveness, and strategic management approached by the Matrix-Q Research Institute includes family to the life-work balance equation. As the decision making for the wellbeing of family, in its holistic sense, is fundamental for the happiness and success of individuals which are parents. And in general should be for any one, including those not yet experienced into parenting. The emerging global culture and civilization needs parenting schools, as modern culture in its individualist approach to live and prejudge on the value added by family tradition and clan, has lost the ability to transfer parenting skills to new generations. Parenting skills learned generation by generation have, according to family tree, advanced and specialized, holding specific traits, skills, guidelines and principles, or values, applied for perception, decision making and education of children; including if apply respective cultural perceptions and values. In the same intention, sexual education and conscious sexuality, both, are essential aspects in the education of parents. As their happiness and ability of self-enjoyment as householders is also an example for children that will become adults. But mostly because through sexuality communication, collaboration and cocreation can be developed with a more profound meaning, function and add value to the parenting skills. The abilities to listen, communicate and collaborate, make choices, set strategies, in favor of the well being of the family, and the happiness of parents and children are essential for parents. 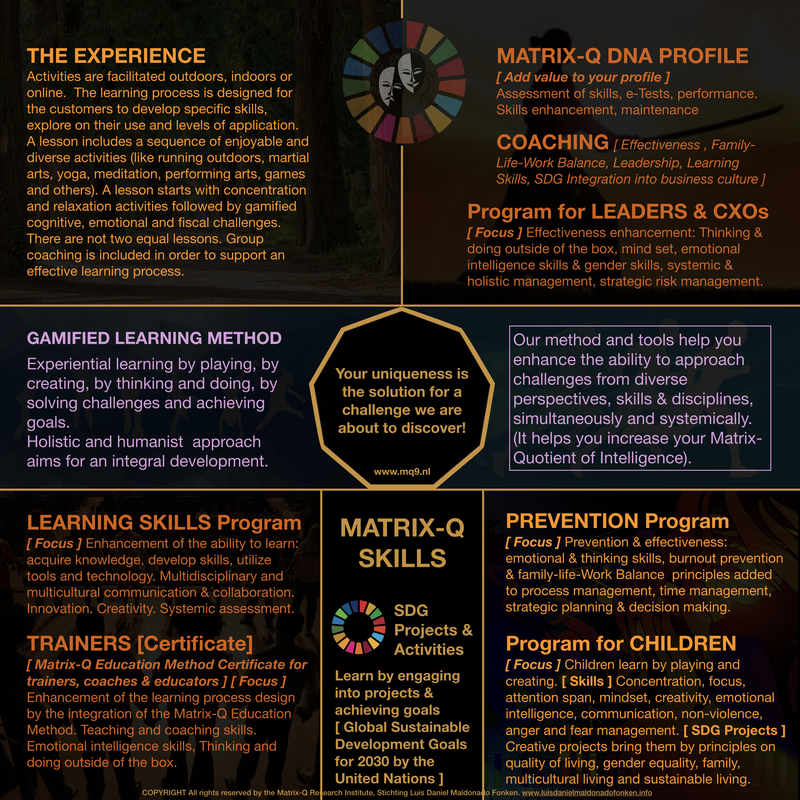 Parents that engage into a conscious effort to develop skills, discover own talents, by embracing the experience of parenting, may allow themselves to discover a completely new world of possibilities and capacities, potential, ready to be explored and developed. Human enhancement takes place already through a natural experience of parenting. 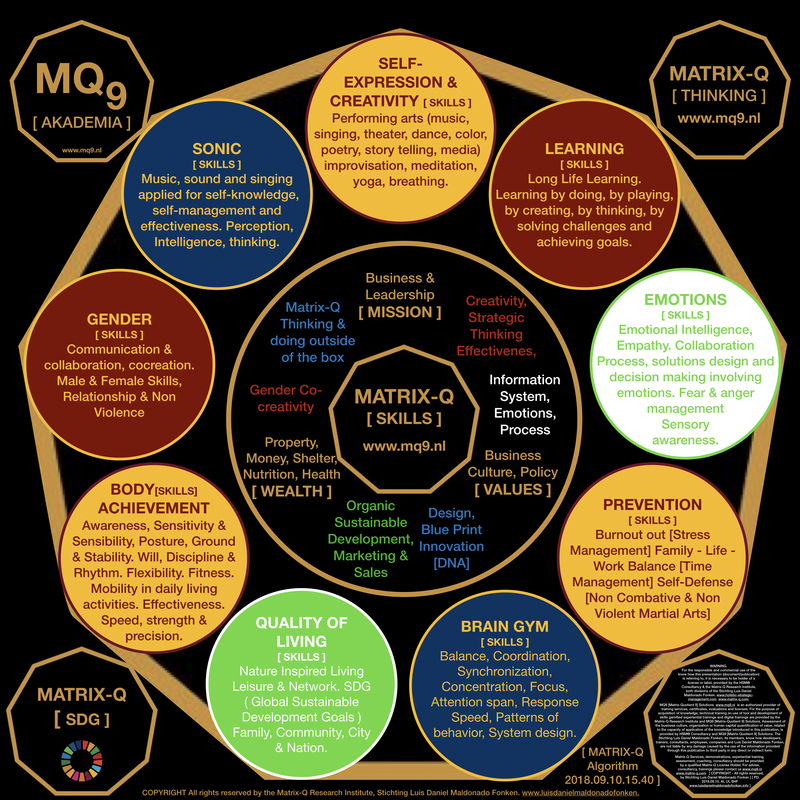 On addition, from the point of view of Matrix-Quotient of Intelligence, which sign the ability of individuals to solve challenges by approaching them from several perspectives/disciplines/skills simultaneously, parenting provides an advanced setting for training, which Matrix-Quotient of intelligence can be developed and enhanced. Also in this case parents need of a conscious effort and the ability to learn, develop skills, through self-knowledge and by taking responsibility of themselves and their family happiness through being parents. 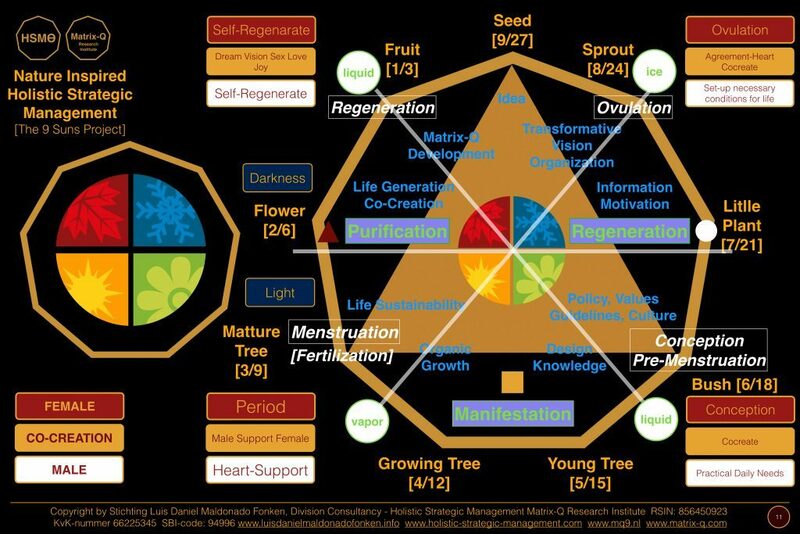 Within this frame, decision making in community, business, job positions, which has direct and indirect impact in the life of a family needs to be assessed by individuals correctly, from their natural sensitivity as parents. 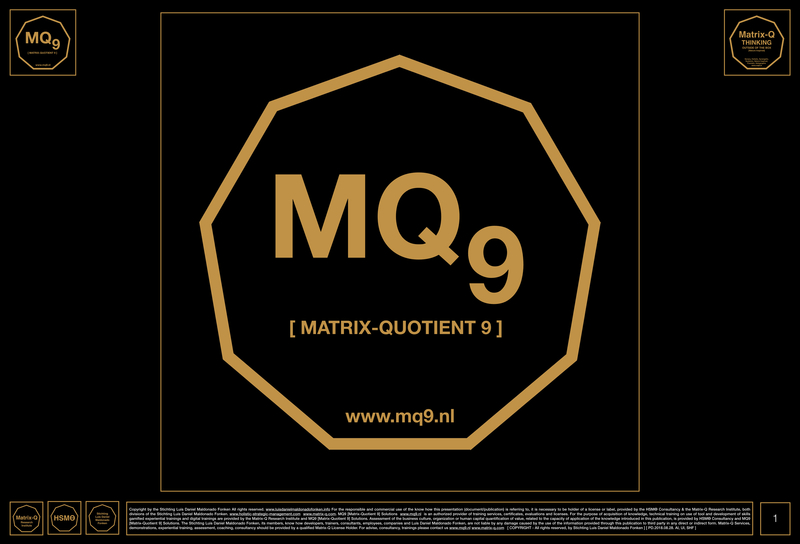 Here, as well Matrix-Q Emotional Intelligence skills becomes fundamental for decision making. 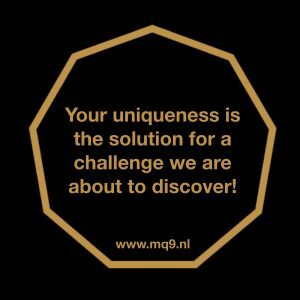 The Matrix-Q Research Institute studies on single parenting (1998-2016) has brought several questions regarding the detrimental condition generated by single parenting in the development of skills. Co-parenting creates and sustains family stability, as emotional and psychological, giving space to a series of skills to be developed naturally and step by step (in most of the cases) if the parents learned how to allow it, listen to themselves and to the need of development of those skills, and nurture the process of learning. In the process of co-parenting both parents will learn practices and skills, face limitations, past trauma, discover weaknesses, strengths and find themselves into a learning curve towards mastery of the experience and role of parenting. In the most successful cases both parents will evolve simultaneously and the process itself will enrich their love relationship and add value and enhance the sustainability of their relationship and family. While lack of preparation and in modern times more common, as described above, lack of references on parenting best practices, may bring on the contrary a great deal of stress, frustration, and lack of happiness to both parents, transforming their responsibility and role of parents into a burden and shifting their love relationship into duty and sacrifice; which in modern times, for a modern culture dissociated from traditional family and clan values, will end up mostly in divorce and separation. Single parenting on the other side offers to the individual the great challenge of playing both roles, male and female, and achieving individually the state of happiness and success, achievement. A complex challenge which demands a bold and as well advanced undertaking, for which most of single parents have not the necessary foundation. In addition, the natural seek for a co-parent, as for natural strategy for achieving successful and effective parenting, will condition and some times hold the single parent from realizing own self and mastering parenting alone. Several examples of successful single parents, also bring us to the next generation, examples of their children as productive citizens with social sensitivity and entrepreneurial skills or success driven. While on the contrary, not successful single parenting, would not only be marked by unhappiness and frustration in the parents but as well become a detrimental influence in the development of the children. 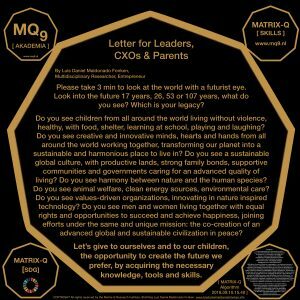 The measurement of success from the point of view of individual realization and the ability of the legacy, children, and following generations, to achieve similar, is for the Matrix-Q Research Institute a sign of effective achievement. A sustainable love relationship means in this context the ability to hold on together, facing challenges and learning curves, changes and personal development, for as long love is present in the relationship.